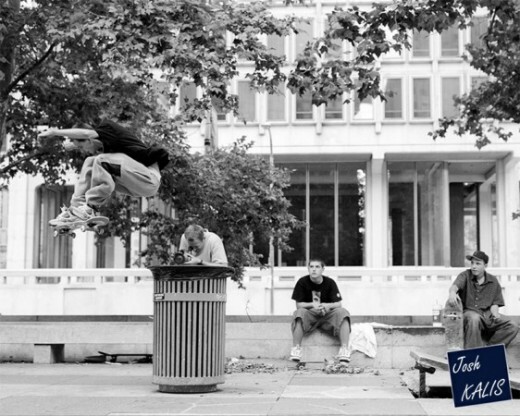 Think of Josh Kalis and you think of Philadelphia and, more specifically, Love Park. Hanging around with Li’l Stevie, boosting the best tres in the game out of propped up slabs? Kalis and Philly go together like fish and chips. Did you know the DC Footwear pro is actually from Grand Rapids, Michigan though? To be fair it’s not exactly a secret (and most older fans are well aware of his roots) but if you weren’t lucky enough to be party to his trick stomping heyday then this five part career retrospective from The Berrics will tell you everything you need to know from one of the most important skaters of the 1990’s and 2000’s. Following the same tested format as the amazing Guy Mariano piece last year, we’ll see Josh’s exemplary career looked at in depth over the series and, we’re hoping, some brand new footage to close things up. His Sabotage 4 part last September proved he’s no slouch in his advancing years so we have everything crossed in the hope of yet more “Dowtown skateboarding” from this veritable legend. That really would be something to savour!